BROOKLYN, N.Y., Jan. 2, 2018 (SEND2PRESS NEWSWIRE) — Rising young stars and returning champions from all over the East Coast shared the spotlight throughout this holiday weekend at the second preliminary meets of the nation’s largest women’s amateur track and field series, the Colgate Women’s Games. Extreme cold temps had little effect on top contenders, some who come from as far as New Hampshire, Massachusetts, Virginia and Georgia, as they continue to improve an already fast national pace. Returning hurdles champion Sophia Myers of Queens High School of Teaching, won the 55MH in 8.21; continuing an undefeated streak that began week one of last season’s series. Brooklyn’s Daniella Griffith of Medgar Evers Prep won the 400 Meters in 1:00.16; Athing Mu of Trenton High School in New Jersey scored her second consecutive double win with improved times in both distance events, crossing the tape first in the 800M (2:18.81) and 1500M (4:53.82). In the High Jump, with event champion My’Khiyah Williams out this week, Phoebe Myers of Young Women’s Leadership School cleared the bar at 5’2” for the win; and Manhattan’s Mariam Cisse won the Shot Put with a toss of 10.78M. In the Mid School Division on Saturday, 12 yr-old Avery Lewis of Westtown School in West Chester, PA remains one of the fastest young sprinters in the nation, scoring another double win in the 55M (7.19) and 200M (25.15). The four-time Colgate Women’s Games sprint record-holder’s performance in the 200M was another personal record for Lewis. Having won the 55M at the first preliminary meet in another personal best (7.16), officials said her times are likely among the fastest in the nation for a twelve year-old this year. Toussaint adds that the Colgate Women’s Games strive to retain a welcoming atmosphere for athletes of all abilities. “Our goal is to help girls of all ages build self-esteem through friendly competition, encouraging them to discover and then challenge their own limits,” she said. Toussaint said the Colgate Women’s Games have become a proving ground, drawing top athletic talent and have produced hundreds of national champions, and with last summer’s six alumnae Olympic Team USA, 26 former Olympians. More importantly, she adds they continue to have a positive effect on countless lives over more than four decades. In the Mid School Division on Saturday, Peyton Rollins of Andrews Middle School was among those who travelled the furthest to compete, all the way from Massachusetts to win the 55MH in 8.31. Rollins, who placed second overall at last year’s Colgate Women’s Games, had more than a dozen first place wins in hurdles races at major regional meets throughout 2017. Simone Kelly of Wissahickon Middle School in Ambler, PA won the the 400M in 59.61; Last year’s first place finalist Alina LaForest of Drexel Neumann Academy, Chester, PA won the 800M in 2:21.10; Brooklyn’s Rainn Sheppard of MS 313 won the 1500M in 4:53.70; and Rowan Houston of Rye Country Day School cleared the High Jump bar at 5’2” for her second win and personal best jump. Melissa Aymil of Mendham Middle School in Brookside, NJ retains her lead in the shot put with a personal best toss of 10.65M. Among Sunday, New Years Eve’s Elementary School B division highlights; Philadelphia’s Amirah Nesmith, last year’s first place finalist in the 200M, ran a 55M tie with Brooklyn’s Kaela Swift of Success Academy Bed-Stuy, both finishing in 7.9. Swift won the 55M at the first prelim in 7.88. Damira Allen of Chester School of the Arts, Chester PA, last year’s Colgate Women’s Games’ Division A 800M finals champion and Special Awards winner for “Outstanding Competitor.…”, now leads Division B after winning the 800M at Prelim 1 in 2:26.68 and Prelim 2 in 2:27.52. Both personal best times for the 10 year-old, multiple Gold-medal Junior Olympic champion. Allen has an astonishing record of more than 40 first place middle and distance race wins at major regional and national mets in her age division since 2015. Additional results for College/Open and Elementary A and 30’s Plus division events are available at colgategames.com/results. 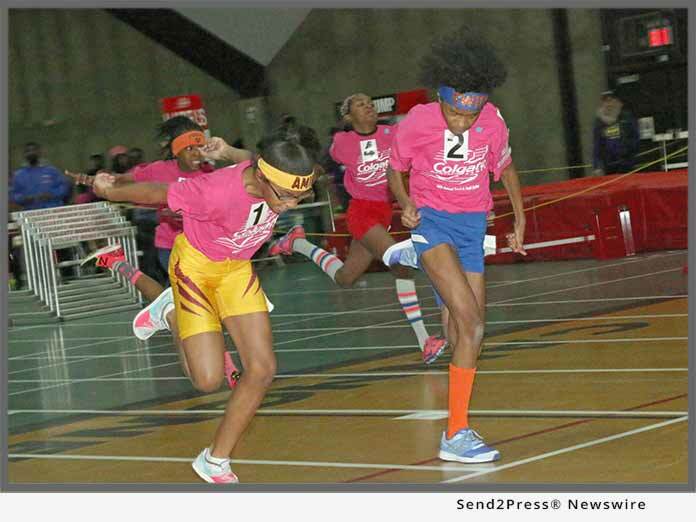 *Photo Caption: Philadelphia’s Amirah Nesmith and Brooklyn’s Kaela Swift sprint to a tie in the Elementary B division 55 Meters at the second preliminary meet of the 44th Annual Colgate Women’s Games in Brooklyn, NY on Sunday. "The number of participants and the size of the crowds made up of families and friends, some who travel great distances is evidence the Colgate Women’s Games continue to be such an important event," said Meet Director Cheryl Toussaint.